This review was written in late December 2013, when the year-old Nook HD+ cost only $149, or about 40% off its original retail. The review unit was purchased at full retail ($270) and has a free case which was given to me by M-Edge (I got it because all of the B&N cases were cheap looking junk). By late 2013 the Nook HD+ from Barnes & Noble had stopped being the premium device that B&N launched in Fall 2012. Thanks to the launch of numerous dual-core Android tablets with screens ranging from 7" to 10" and prices ranging from $80 to $199, the Nook HD+ has long been simply one of the many budget tablets on the market. There are in fact at least a half dozen decent 9" tablets on the market in December 2013 that cost less than the Nook HD+. And when I call them decent I mean that they have dual-core CPUs; I wouldn't bother with a single core tablet when, for example, RCA has a dual-core 9" tablet for only $99. Unfortunately that tablet and most other 9" tablets are also hampered by low resolution screens (some also only have 4GB of storage). Their screen resolutions are (for the ones I found) usually 800 x 480, which is considerably less sharp than the resolution on the Nook HD+ (1920 x 1280). The Nook HD+ is a fairly ordinary looking Android tablet. It has black metal trim around the screen, a gray rubberized metal back, and a metal accent in the lower left corner which resembles a loop. There's a single speaker on the rear of the Nook HD+, and on the upper edge you will find volume buttons, a headphone jack, and (I think) the microphone. The power button is on the upper right edge, and along the bottom edge you will find a microSD card slot and a custom expansion port. 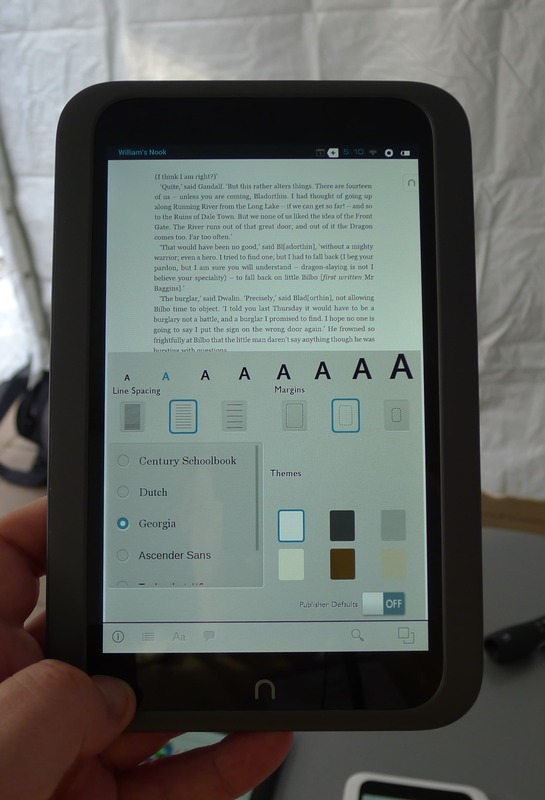 The Nook HD+ is running a heavily customized version of Android 4.0 on a dual-core 1.5GHz Texas Instruments CPU with 1GB RAM, 16GB Flash storage, Wifi, and Bluetooth. The 9" screen has a resolution of 1920 x 1280, far sharper than anything else in this price range. There are no cameras, sensors, or extra ports on this tablet, but there is that expansion port. This was probably intended to work with a variety of accessories, but so far as I know the only accessories which used the expansion port were a charging dock and a dongle that broke out an HDMI port. There are other accessories (speakers and a KB), but they use Bluetooth. The NooK HD+ was originally intended as a premium quality device with a premium price tag, and you can see that in the hardware design and build quality. You will not be able to find hardware this good on any other tablet this cheap. The Nook HD+ has a 9" screen with a resolution of 1920 x 1280. It was the highest resolution screen when it came on the market (and was built to a quality that matched any of the premium tablets), but has since been supplanted by newer and more expensive tablets like the Fire HDX 8.9 and others. But all of those tablets cost a heck of a lot more. Look at this screen in comparison to equally cheap tablets, and it is safe to say that you won't find any tablet that has a screen with such high resolution. All of the nice things you've heard about this tablet's screen are true. This is easily the best feature on the Nook HD+. The Nook HD+ has far better battery life than most budget tablets. I ran my usual test on my year-old tablet and concluded, based on playing a video for an hour with the screen at full and Wifi on, that the Nook HD+ should last for at least 7 hours of video. If you are careful about about power management you should be able to extend that considerably. It's also worth noting that the Nook HD+ didn't show any sign of the common sleep/battery issue found on many other budget tablets. This tablet didn't drain its battery while asleep, and it has an expected 4 to 5 days of standby time. The Nook HD+ started out not as an Android tablet but as Barnes & Noble's special snowflake, which means that it has heavily customized software. This can be confusing for someone who buys this device and expects to see an Android tablet, but there's nothing in the software that should stump a new user. 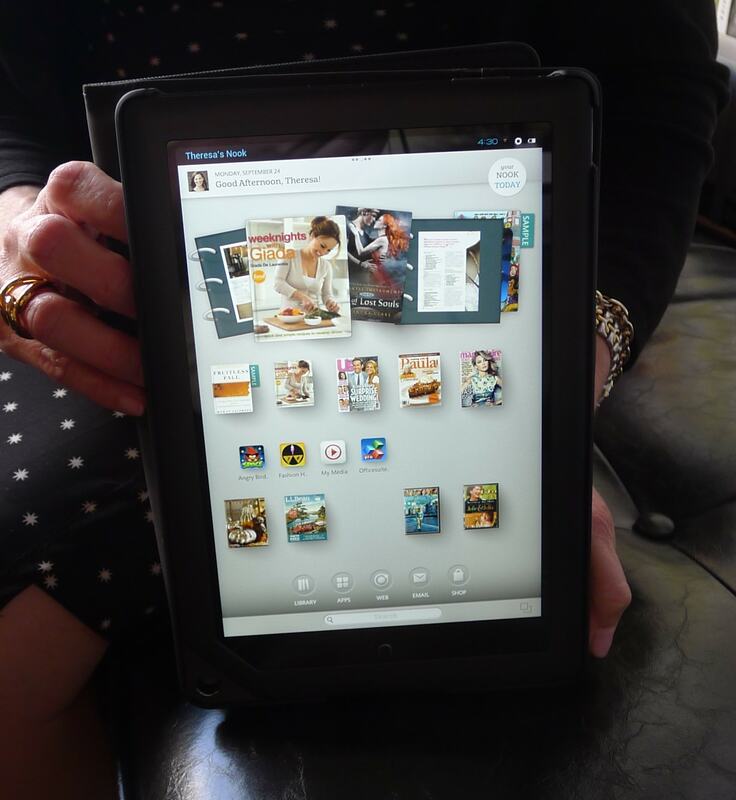 In addition to a uniquely confusing home screen and a custom settings menu, the Nook HD+ also has a special Library menu for all of your various types of content: apps, ebooks, movies & tv, Kids (I don't know why this is a type of content), newspapers, and catalogs. That last refers to one of B&N's better failed ideas; B&N had worked out deals with various retailers to let Nook HD+ owners browse and shop in various catalogs. This tablet has a 9" screen, so I'm sure you can imagine how nice it could be. One of B&N's other good ideas was the addition of child and alternate adult profiles. This wasn't widely implemented across the Nook platform, unfortunately, but if you own a Nook HD+ (or a Nook HD) you can set up accounts which have only limited access to certain pieces of content or certain types of content. (I have been told that the accounts will also work on the Nook iPad app, but I have not seen it myself.) It was a great idea when this device was announced, but in the past year both Amazon and Kobo have come up with similar offerings (Kindle Freetime and Kobo Kids Store). B&N changed a lot when they tried to create a special Nook snowflake from an Android tablet, but I think the single biggest mistake was their decision to block you from sideloading apps. When this device launched they allowed you to get apps from their app store, and that was it. In May 2013 B&N decided to permit Nook HD+ owners to install apps from Google Play, but they still won't let you download apps from anywhere else (like the half dozen or so legit app stores). B&N's decision, more than anything, is probably what doomed B&N's hardware efforts. The Nook app store was and is frankly pathetic, and its limited selection does not include such basics as OverDrive, Adobe Reader, or a decent free news reader app. B&N's decision to try to extract every last cent from their captive audience resulted in a device that violated Tim O'Reilly's maxim: Don't capture all of the value. B&N left such little value for the user that many potential customers recoiled at the idea of paying a premium price for such a limited device, and they instead bought hardware from another vendor. What a difference a year makes. Or rather, doesn't make. The Nook HD+ originally shipped at a time when its leading competitors (Kindle Fire HD 8.9, for example) all ran on dual-core CPUs. But now that it's a year later and the Fire HDX runs on a multi-core Qualcomm CPU, how does the Nook HD+ compare? That depends. If you compare the Nook HD+ to the Fire HDX I am sure that the latter would come out ahead. But with the Nook HD+ now costing under $200 (the Fire HDX costs twice as much), I think it better to compare this tablet to other budget tablets. I haven't put my hands on any large budget tablet recently; I've been too busy with 7" tablets. And the Nook HD+ doesn't compare too well. I had my Hisense Sero 7 Pro handy, so I tried playing Angry Birds on both tablets. I have found that the Sero 7 Pro offers performance that is comparable to a dual-core tablet (in a much prettier shell) so this was a good tablet to use as a yardstick. There was a noticeable difference in the general speed of the 2 tablets. The Sero 7 Pro was zippier in loading the app, loading levels, and other in-game activities. In part this was because the Sero 7 Pro had a Tegra 3 CPU driving a smaller screen, but in general the Nook HD+ just felt slower. Luckily the Nook HD+ caught up when I browsed the web. This tablet has Chrome as a web browser, but once I swapped it out with Opera the tablet performed admirably. I can also vouch for how quickly the touchscreen responded, and the speed at which web pages loaded. Having started its life as an enhanced ebook reader, you would think that the Nook HD+ would have a great reading app. Much to my surprise, no, no it does not. The Nook reading app on the Nook HD+ offers 8 font sizes, 6 background colors, 6 different fonts, and several choices of line spacing and margins, so there should be enough options to satisfy most readers. There's even an option for using publisher defaults. But in spite of the many options I found this app to be unusable. It was unstable, and it crashed several times over the course of a week. It also lost my reading position on a regular basis (twice in the past hour, in fact), and it sometimes forgot how the formatting options had been set. And right now the app is turning the page at random intervals while ignoring some of my attempts to turn the page. And those aren't the only issues I found. This is a heavier and larger tablet, so naturally most reading will be done at a greater distance than with a lighter 7" tablet - possibly even further than arm's length. It's not unreasonable to expect that you might set the Nook HD+ on a table and surround it by books and papers. In case you're wondering, the margin shouldn't increase with the font size. And then there is the justification *shudder*. That is clearly not ideal, and between one issue and the other I recommend that you get another reading app. I have had this tablet for well over a year, but it wasn't until the past few weeks that I started looking at it with a critical eye. I have found, as I use it more and more, that it does have the great hardware that I recommended when I last considered this tablet in November. The software, now that's another matter. I can without hesitation recommend this tablet - but I also think you should plan on spending some time replacing key apps. Barnes & Noble's software leaves a lot to be desired. The home screen is rather clunkily designed, the Nook reading app is unstable, and Chrome - I so wish Google would stop forcing it on all and sundry. I would look for alternatives for all 3 in Google Play; you have plenty to choose from. You might even want to go so far as to replace the firmware entirely and instead install CyanogenMod or buy a Nook2Android card (which BTW is based on CyanogenMod) but that might be more work than you would think worthwhile. But if you are as unhappy with this tablet as I am then it is worth the effort. Installing CyanogenMod would give you an up to date version of Android, and it would also replace B&N's funky menus with standard ones. It would also let you sideload apps, which is worth more than you might think. How would you like to stream Amazon Instant video? Sorry, but you can't do that until after you sideload Adobe Flash. Update: I found an alternative to Adobe Flash which let me stream video from Amazon. As a long time Kindle reader I was surprised to find a NookHD under my tree on Christmas! Since I complain loudly about notbeing able to see my iphone screen I am in heaven with this large display! But ……now I need a Kindle reader on here and I am confused? Root, not root? What does that even mean? I have no experience with Android systems. You do not need to root the tablet to install the Kindle app. From the Nook HD, go to the Google Playstore and search for Kindle app and install. It is a free app. Sign into the app with your usual account info for kindle. Now you can download all your books. I’ve been using Nook HD+ as my preferred reader for 6 months even though I still use my ipad for reading PDFs. I have done a good deal of reading on the Nook SW reader, and I haven’t seen anything like you have described. Never crashed once, and in fact, I do a lot of switching between publisher defaults and user defaults when testing my ebooks. No problem — oh, maybe a hiccup here or there, but nothing like what you describe. I haven’t found the different profiles to be usable. I want a way to make apps accessible to different profiles, and this doesn’t seem easy to do. I am not particularly happy with how you can organize your home page. I have noticed that bluetooth is not as flawless as it seems to be with my ipad1. One thing I find annoying (and I can’t seem to find a solution for) is to stop sounds for notifications. Apparently I am not doing it right, or whatever I’m turning off is not staying off. Another petty thing. Why did they put the volume controls on top? I never seem to be able to find it with my fingers. I also find it cumbersome to switch between apps and ebooks. The best thing about the HD+ is having an external card — which I put a ton of music on. Nate, thanks for the updated review. It should be helpful to many who are looking for a decent large screen tablet at a reasonable price. I’ve had my HD+ for about 4 months now and agree that for a combination of price, features and build quality it can’t be beat. One comment I’d like to make is on the choice of cases. I’ve always used folio style cases such as the M-Edge case that you’re using and that’s what I bought when I got my HD+ but I found that it made my HD+ feel heavy and awkward to use. I switched to a silicone case and a zippered sleeve and find it much more comfortable to use. I both both from Amazon at a combined cost of less than $15. Secondly, I’m generally not a fan of screen protectors but found the HD+ to be unusually prone to reflective glare, fingerprints and smudges and installed a matte, anti-glare screen protector on mine. It solved the problem and I recommend doing so. This is a heavier case, yes. I like that it’s heavy; it reminds me to be careful when I carry this tablet around. I can’t get as good of a grip on larger tablets as on 7″ tablets, so I am always worried about dropping it. Thanks for the review–but your link to “an alternative to ADOBE Flash” currently links back to this page, not to any article about an alternative. Any chance of learning what your alternative is/was?